The United States is undergoing a critical demographic transition: The population is aging. By 2040, the proportion of people over the age of 65 will top 20 percent, and people under the age of 18 will make up almost 23 percent of the population. As a result, the oldest and the youngest populations combined will make up almost half of all U.S. residents. This trend is also a global one, directly affecting planning practice worldwide (WHO 2007). As planners work to plan and design sustainable and livable communities they will need to simultaneously consider the needs of these similar, yet different, populations in future plans, policies, and projects. 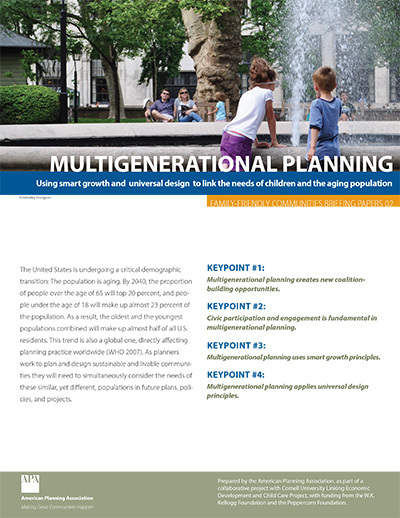 This briefing papaer explains how multigenerational planning creates new coalition-building opportunities; why civic participation and engagement is essential for all age groups; and why an understanding of the needs of multiple generations is essential to smart growth and sustainable design and development. Esther Greenhouse is a unique professional. She is an environmental gerontologist—a specialist in the impact of the built environment on older adults--and a designer. A nationally recognized expert in Universal Design and Aging in Place, her focus has expanded to include multigenerational community planning--a key approach to creating successful Age-Friendly Communities. An award-winning and enthusiastic instructor and speaker, she advises clients to view the built environment as a missing variable in public health, infrastructure, and social services. This is key to enabling greater independence and well-being. A catalyst for change, Ms. Greenhouse applies the Enabling Design Approach in her work with communities as they evolve to meet the needs of both seniors and younger generations. Ms. Greenhouse has served on the American Planning Association’s Aging in Community Policy Guide Task Force, co-authoring the Housing, Zoning, and Transportation sections, has written portions of the Livable NY Resource Manual, and teaches the NAHB/AARP Certified Aging in Place Specialist (CAPS) courses (for which she was awarded CAPS of the Year). Her innovative perspective has resulted in invitations to contribute to the book Independent for Life, the 4-part PBS series “Design for a Lifetime”, and the design of the nation’s first elder-focused emergency department. She has designed private residences, and her latest endeavors include graphic facilitation and expanding her role with the Cornell Institute for Healthy Futures. At Cornell University, she was the first design student to pursue the Gerontology certificate, and has worked as a research associate in the Cornell Institute for Translational Research on Aging (CITRA). Ms. Greenhouse’s B.S., M.S., and doctoral studies were in the departments of Design & Environmental Analysis and City & Regional Planning at Cornell University, where she has been, and continues to be, an interim lecturer and advisor. George Homsy is an assistant professor in the Department of Public Administration at Binghamton University where he directs the Sustainable Communities masters program. Homsy researches the factors that shape sustainability programs and planning policies at the municipal level. In particular, he examines the ways that cities and towns balance the environmental, economic, and equity dimensions of sustainability. Homsy also explores the nexus of heritage and sustainability, especially in neighborhoods. Before returning to Cornell University’s Department of City and Regional Planning for his PhD, Homsy was a planning consultant helping small- and medium-sized municipalities create environmentally and economically sustainable communities in New York and Massachusetts. Homsy frequently links his academic research to practice through collaborations with practice-based professional organizations, such as the American Planning Association. Dr. Warner is a professor of City and Regional Planning at Cornell University. Her work focuses primarily on local government service delivery, economic development and planning across generations. Dr. Warner's research explores the impact of privatization and devolution on local government and the role of human services as part of the social infrastructure for economic development. Her work on planning across generations - multi-generational planning - explores new community development models for addressing human services and linking the needs of children and elders.